What could be more satisfying than this recipe for Spicy Penne all’Arrabbiata for a simple week night meal? With only a few simple ingredients and just 30 minutes, you can make this classic Italian pasta dish. Easy, quick & economical. Are you willing to take the heat? By definition, arrabbiata means angry. Consider this: once you eat this pasta dish, the heat from the hot chili peppers will make your face turn red, just as you would if you were angry. There are some that believe that the reference is to the vibrant red color of the sauce, a color which is also associated with the emotion of anger. Either way, hot chili peppers are just one of the ingredients to make this dish. It’s important to remember that because Italian cooking uses so few ingredients, the key to a great tasting dish is to use ingredients of superior quality. Let’s take a closer look at these 7 simple ingredients required to make this easy recipe for Spicy Penne all’Arrabbiata. Simple Ingredient #1: The pasta. When it comes to choosing the pasta associated with this traditional Roman dish, you must use pasta that has ridges. The classic, of course, is penne. Rigatoni would also make a good choice. The sauce is easily entrapped within the little groves of the pasta, so using a pasta with ridges will make it easier to scoop up more sauce with every bite. If you are trying to increase the fiber in your diet, I would recommend choosing whole wheat penne (or rigatoni). Simple Ingredient #2: The garlic. There is nothing like fresh garlic. I am very fortunate to grow my very own garlic in my backyard (I have my Dad to thank for that). When I peel away the layers of my garlic, I always end up with sticky fingers – a definite sign of freshness. And I’m so happy that my garlic has already surfaced from the spring’s thaw! 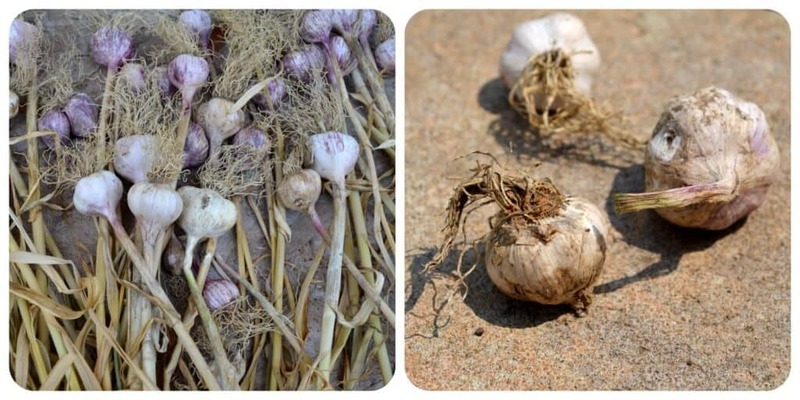 When purchasing garlic, make sure that there are no sprouts; that the outer skin is papery thin; and that the bulb is firm when you give it a squeeze. 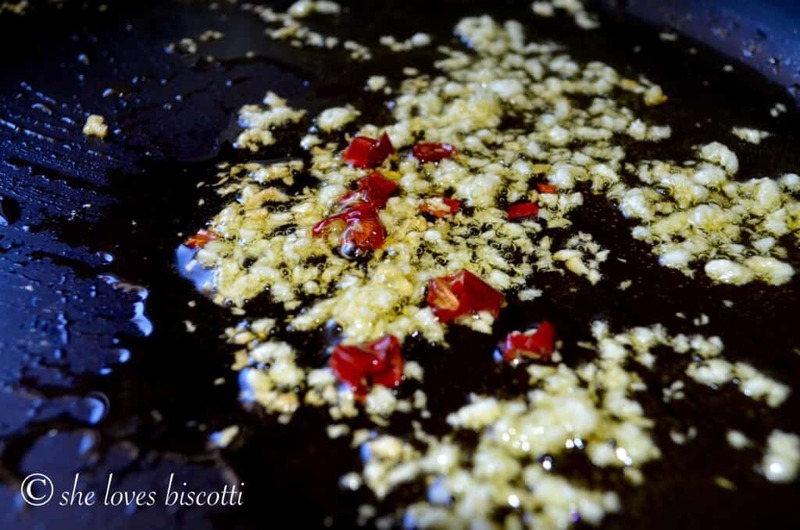 If you are a lover of garlic, you can always add an extra clove or two to the recipe. 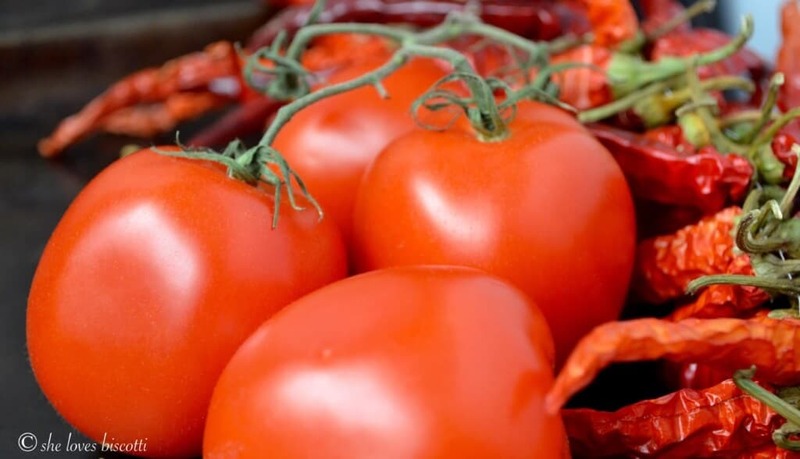 Simple Ingredient #3: The tomatoes. The base for so many great pasta sauces. I will always use fresh tomatoes in the summer (roma or san marzano with skins removed, seeded and chopped); and canned in the winter (whole and peeled). In my household, we prefer little chunks of tomatoes in the sauce, so we just chop up the tomatoes into small cubes. As they are cooking, they will soften and it becomes easy to crush them even further with the back of a spoon or a fork. If you prefer a smoother sauce, you can pureé the tomatoes instead. 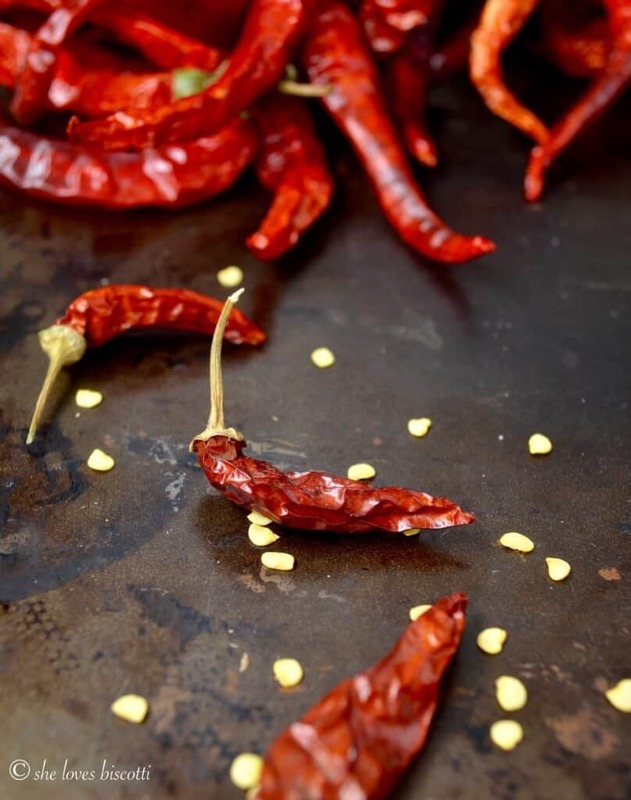 Simple Ingredient#5: The hot chili peppers, aka peperoncino. The source of the heat. 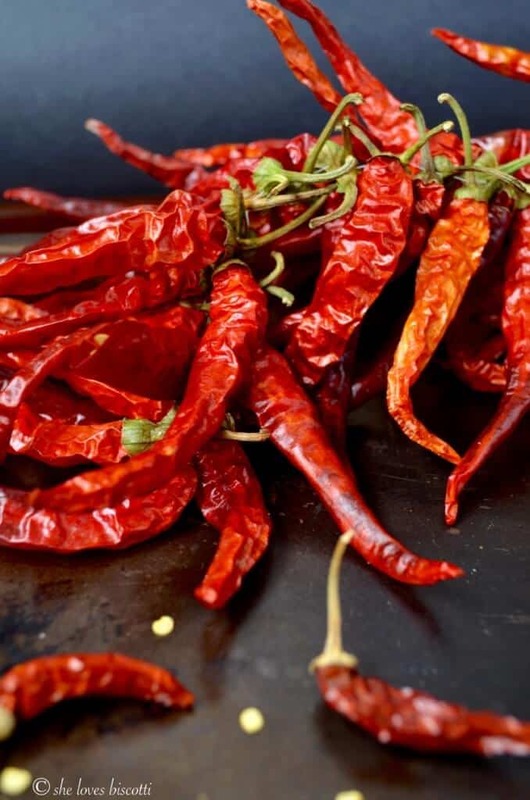 The first thing you should know is that you can add as little or as much of the hot chili peppers that you can tolerate. You can easily replace the peppers with crushed red pepper flakes. Once again, let your personal tolerance of heat be your guide as to the amount which should be added. Remember, a little goes a long way with these guys. Simple Ingredient #6: The olive oil. An essential ingredient for Italian cuisine. Because it is a monounsaturated fat, olive oil is considered a “healthy fat.” It is also a great source of antioxidants. However, it is a calorie dense food. So take out those measuring spoons because it’s so easy to drizzle away hundreds of calories on a plate of pasta. 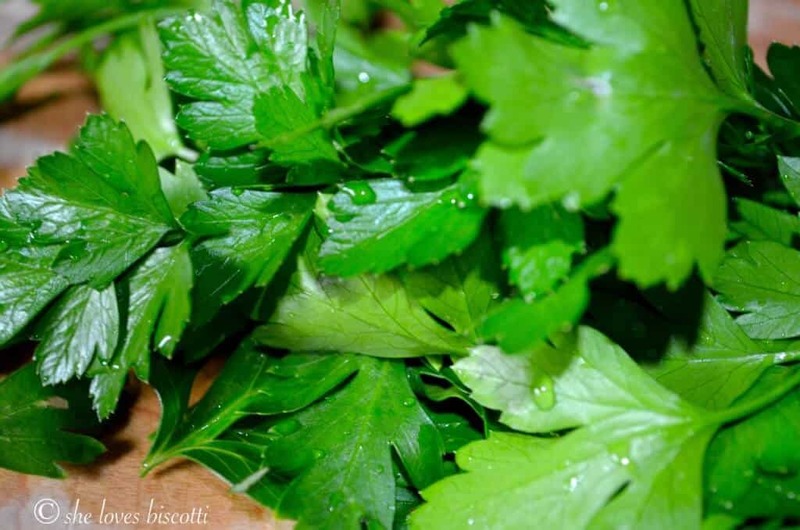 Simple Ingredient #7: The flat-leaf parsley. This herb is a staple in so many Italian dishes. Not only does it provide a wonderful splash of color, it also contributes a pungent taste which is essential if you are trying to create a balance of flavors in your dish. Whenever possible, fresh is definitely better, and don’t even consider using the curly kind. And there you have it… just 7 simple ingredients in this quick, easy and economical recipe for this Spicy Penne all’Arrabbiata. Many years ago, my husband, Claudio, used to work in an Italian restaurant. He became friends with the chef, who originated from the eternal city of Rome. It was here that my husband adapted this recipe. 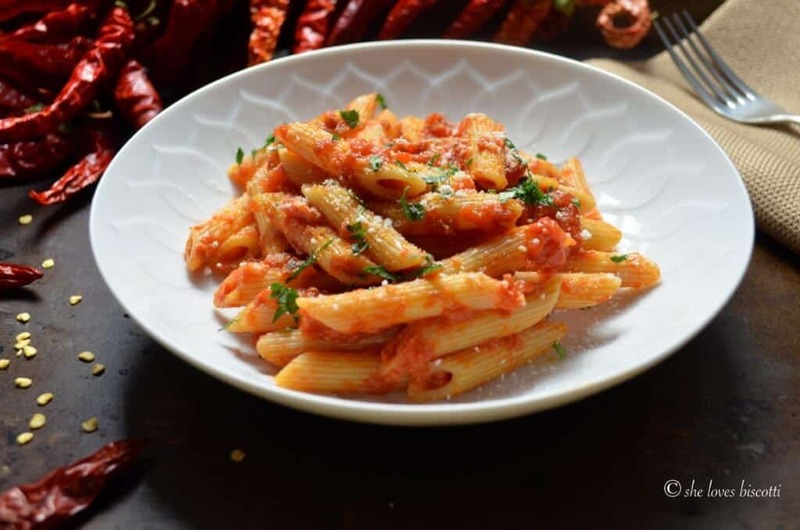 After all these decades, this recipe for Spicy Penne all’Arrabbiata has become one of his signature dishes – a hearty, spicy primo piatto made with only 7 simple ingredients that comes together in less than 30 minutes. Easy, quick and economical. And there you have it… what could be more satisfying than a plate of Spicy Penne all’Arrabbiata for your Sunday Supper? Are you willing to take the heat? What could be more satisfying than this recipe for Spicy Penne all'Arrabbiata for a simple week night meal? With only a few simple ingredients and just 30 minutes, you can make this classic Italian pasta dish. Easy, quick & economical. Are you willing to take the heat? In a large saucepan, heat the olive oil over medium-high heat. Add the garlic and sauté for 1 minute or until fragrant (do not brown). Add the peperoncini and sauté for another minute or so. Stir occasionally while crushing the tomatoes with the back of your spatula (you can add some pasta water if your sauce begins to stick to your saucepan). While the sauce is simmering, bring a large pot of salted water to a rolling boil. Add the pasta to the boiling water and cook for about 8 minutes or until al dente. Serve immediately, garnished with parsley and cheese. We always use fresh roma tomatoes in the summer (with skins removed, seeded and chopped). Throughout the rest of the year, we use canned tomatoes. Recipe will make 2 generous portions or 4 entrees. Every Sunday, there is a wonderful group of bloggers called the #SundaySupper tastemakers that collaborate together on a theme. As was mentioned, today’s theme was Spice is Nice & Some Like it Hot and I think you’ll agree the line-up of recipes is totally amazing! I would like to thank the event host for this event Sarah of The Chef Next Door. Thanks Sarah! If you have a chance you should really check out these great recipes contributed by these wonderful food bloggers. Buona Domenica e Buon Appetito! I love how this recipe sounds so flavourful with only a few simple ingredients. Perfect for a busy night! This looks so good, I’ve been dreaming about making it ever since I laid eyes on it! Love the photography, as usual, and the simplicity of this dish. Have to put this one in my memory bank for those quick and easy meals that everyone loves. Thanks. This is one Italian classic I haven’t tried making yet. Your version looks great! I loved your explanation of the importance of the ingredients. I felt like you took me back to Italy again (was only there twice but would love to go again and again!). Can’t wait to try this. I love the idea of kicking up some penne! I love your recipe and your beautiful photography. This is one of my all time favorite dishes and I will never forget the one place that made me fall in love with it. I was blessed to be able to visit Italy twice and went to a pizzaria in Rome in the Piazza Navona called La Montecarlo. I loved their Penne all’Arrabbiata so much that I kept going back for more. I have always wanted to duplicate that recipe and yours sounds like it would be perfect. Thanks for sharing! Angry never tasted so good. I enjoyed reading your post. Love your post and that your husband’s name is the author! It looks delicious. I’m a lucky gal… and he is also the official pot washer of she loves biscotti 🙂 Thanks for dropping by Shelby.